Patient of dentist, bad teeth. Opened mouth and dental probe. How to cure caries. Senior man with bad teeth. Hand holding dental mirror. How to cure caries. Bad teeth close up. Dental examination procedure. Symptoms of caries. 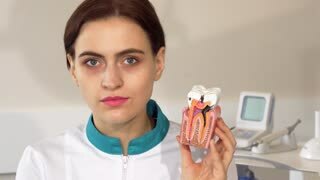 Woman at dentist clinic gets dental treatment to fill a cavity in a tooth. 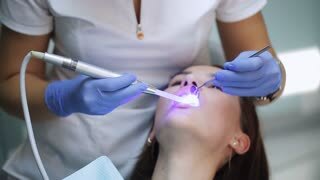 Dental restoration and material polymerization with UV light. Odontic and mouth health is real protection from caries decay.